Recently – TCC Technology Company Limited (TCCtech) congratulates the Thai Beverage Public Company Limited (ThaiBev) regarding their success in winning ICT Excellent Awards 2018 - Core Process Improvement Project Category, awarded for their Van Sales and Merchandising System Project (VSMS). TCCtech was represented at the awards ceremony by Mrs. Waleeporn Sayasit, Corporate Communications Director (the 3rd from left), joining Thai Beverage senior executives Mr. Viriya Vasoontharatham, Consultant (the 4th from left) and Mr. Teerapan Luengnaruemitchai Vice President - Office of Information Technology (the 3rd from right). 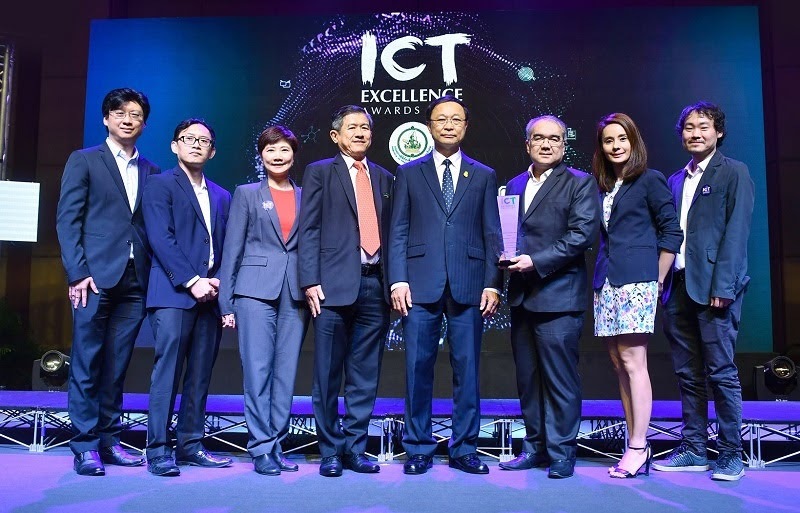 The award was presented by Dr. Pichet Durongkaveroj, Minister of Digital Economy and Society (the 4th from right) at Crystal Hall, The Athenee Hotel Bangkok. The VSMS Project was developed to support an operation of merchandising system on mobile devices. The system enables a flexible sales approach for Van Sales and Pre-sales, also including a Market Insight survey function.